We’re proud to be a part of the Osiris podcasting family. Osiris is a growing community of music and culture podcasts, connecting music fans with conversation, commentary and music. Osiris works in partnership with JamBase, check them out for music news and information. Sign up with your email address to receive news and updates. We won’t bombard you, and you can opt out at any time. We respect your privacy. Your information will not be shared with any outside parties. Thank you! We look forward to hearing from you. Please feel free to drop us a line at southernsongsandstories@gmail.com or contact us on social media. Lisa Stubbs of the duo Mourning Dove at the Velo Fellow in Greenville SC. 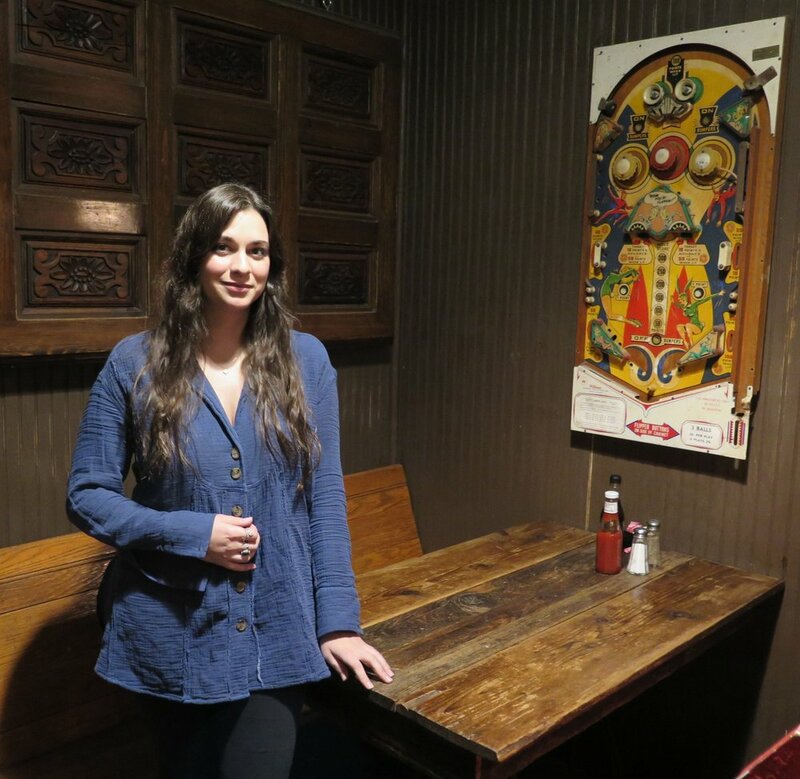 Lisa’s interview and her music is part of our February 2019 episode on artists from Upstate SC. 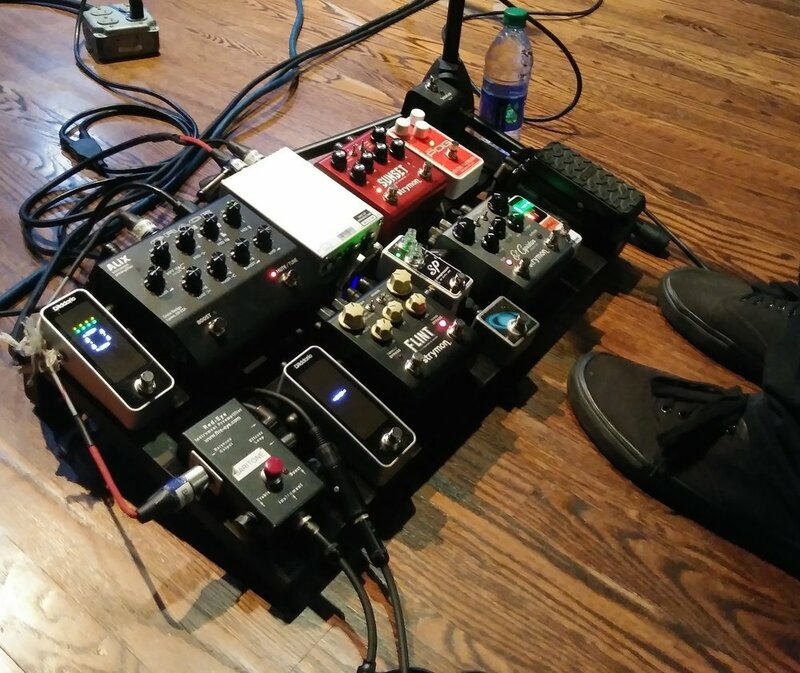 The Steel Wheels mandolin and guitar player Jay Lapp’s pedal rig. Jed Willis and Aaron Ballance talk about old time and bluegrass evolving with its Blues base intact. From our podcast on Tellico. Elizabeth Cook performs at the Albino Skunk Music Festival 10-6-18. Check out our three part podcast series on the spring 2017 Skunk Fest here and on podcast platforms everywhere. Brushy Creek plays at Green Acres in the late 1970s. The Sam Bush Band at Merlefest 2018. Sam gave a shout out to Steve Metcalf on his 70th birthday during this show. This John Hartford poster was one of the most frequently taken by patrons as an unofficial souvenir from Green Acres Music Hall. We are profiling the unlikely success story of this venue in a podcast including interviews of artists who headlined it like Bela Fleck, John Cowan and many others, as well as proprietor Steve Metcalf and people who frequented there. Posters of bands that played at Green Acres Music Hall in rural Bostic, NC decades ago. 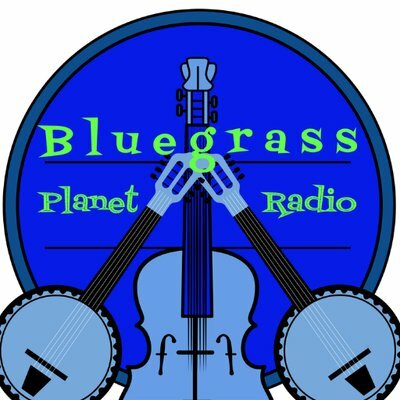 Casey Kristofferson and Hunter Begley of Yellow Feather during filming of their song "Lost All Direction"
Our podcasts are now on Bluegrass Planet Radio at 4PM Thursdays and 1AM Mondays Eastern time! 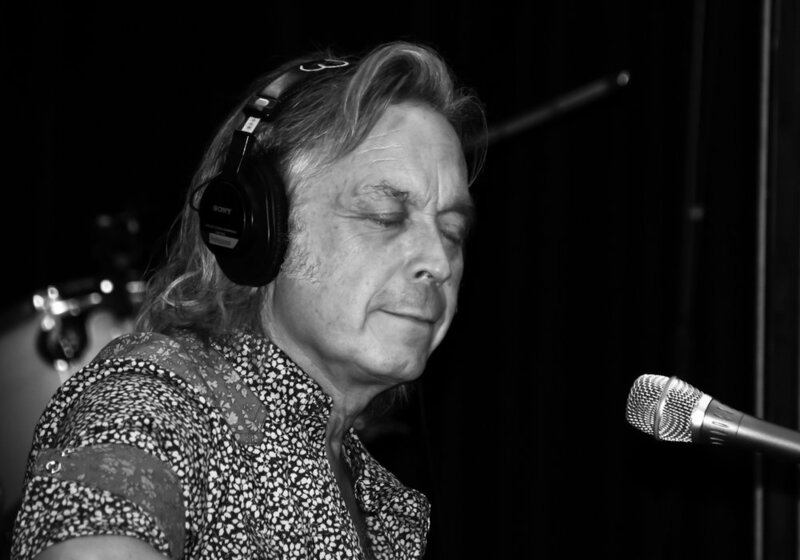 Recently Joe Kendrick was interviewed on roots radio station WMOT. Craig Havighurst's program The String profiled Joe's work at Southern Songs and Stories and WNCW. Check out the article and interview here. David Childers' painting "Face At The Window"
Kevin Kinney of Drivin N Cyrin, at Sierra Nevada Brewery in Mills River, NC 11-9-17. 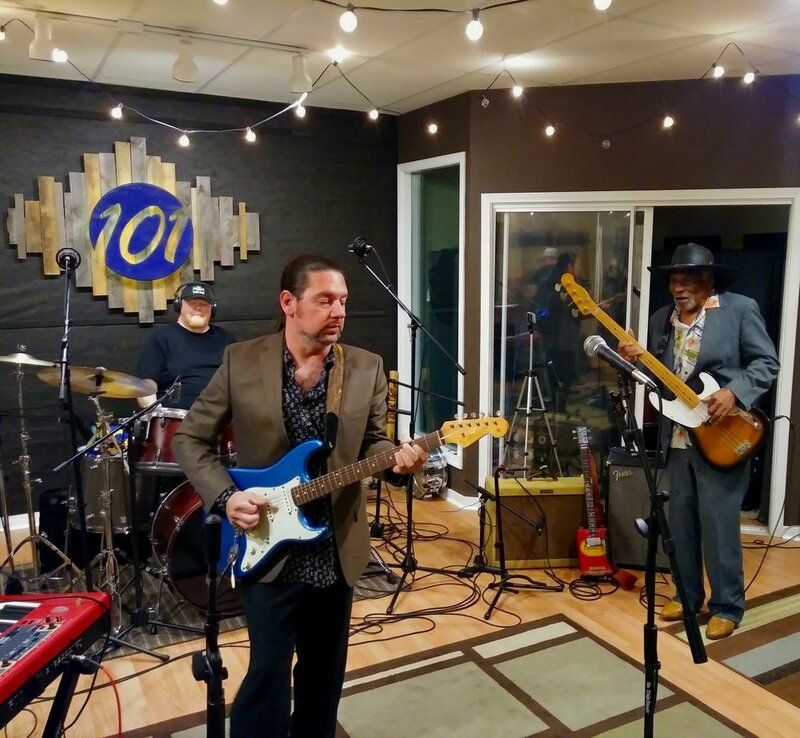 The band played live on WNCW ahead of their inaugural show that night at Sierra's High Gravity Room. Check out the inlay on the neck of Kevin's 12-string -- he bought it from the band Rancid! Halli Anderson of River Whyless at the film shoot for the Night Owl series from NPR as they partner with WNCW for videos from artists in western NC. The Little King, Steve Metcalf, at his home in Forest City, NC, after being interviewed for our podcast on Acoustic Syndicate. He's looking dapper in the hat that Jerry Douglas gave him at this year's MerleFest. Anya Hinkle of Tellico and Jane Kramer performing in Asheville. Jane sang with Anya on her 2016 solo release Forsaken Wind. Aaron Burdett at his album release show at Isis Restaurant & Music Hall 5-12-17. Refuge is available on Organic Records. Donna the Buffalo's gear backstage at MerleFest. The DI on top costs just a smidge more than the amps below it. Okay, a big smidge. Zig in the preacher's robe that he used to great effect during the Shinyribs' set. Remember the bit James Brown did on stage with a similar robe? It was just as good. Set list from one of the Jon Stickley Trio's two performances at SpringSkunk. Stay tuned for our concert videos and a lively interview with the band. The van that serves as one of the "green rooms" at the Skunk Farm, also where artists warm up before going on stage. Joe peeks backstage at the Skunk Farm. Vintage tube radio with an alligator skull and wasp nest to keep it company. Aaron Morrell sets up to take the photo seen directly below. We're happy to share Joe Kendrick's interview with Ellen Pfirrmann, a location scout for HBO and former WNCW host, about her take on Southern Songs and Stories as well as her experience behind the camera in Studio South, a 2007 series profiling western NC artists at Echo Mountain Recording Studio in Asheville. Here is the podcast of their conversation, enjoy! 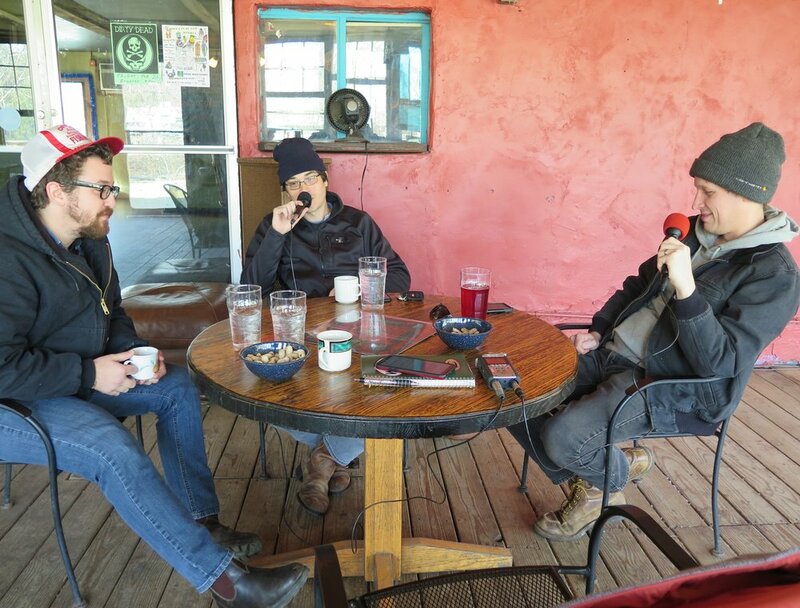 Tellico makes acoustic music that is both true to tradition and uniquely their own. It's music that has appeal for die-hard Americana and roots music fans, while it offers something to folks who never liked songs that even came close to a pair of overalls. Tellico threads the needle of top-notch musicianship and compelling songwriting while simultaneously honoring their forebears and making music that is fresh and new. Amanda Anne Platt of The Honeycutters at Moonlight Mile studio for our film session to make the pitch video for our crowd funding campaign. 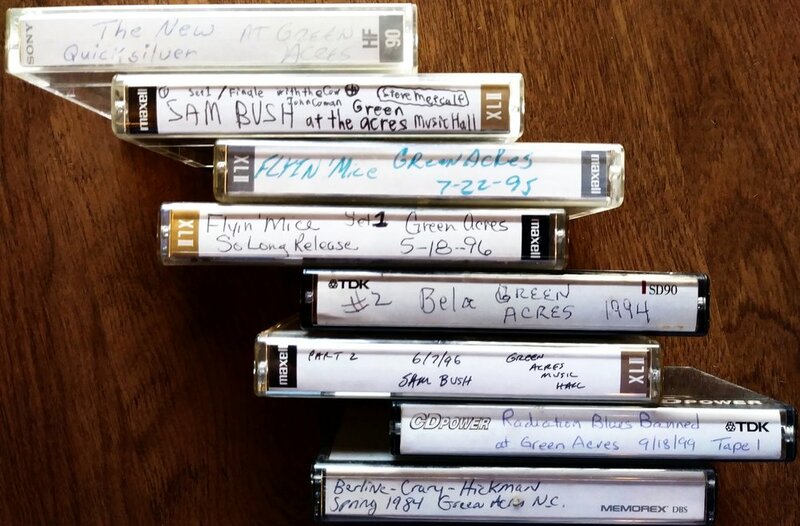 How many times have parents cringed when their children fell in love with a musician? Let's be honest, the world has looked askance at artists of all stripes (with notable exceptions) for most of our history. Musicians tend to be thought of as people who may be great at their art but who are nonetheless pretty bad at life skills like paying bills, getting to work on time, and sticking with the missus. Aaron turns all those stereotypes on their head; he is not only a fantastic songwriter and musician, but he also runs his own construction business and is a devoted family man living a stone's throw from where he grew up in the western NC mountains. He is as meticulous and intense about his guitar and ballads as he is about his green built homes and raising his two girls. As you'll see in our pilot episode, Aaron does both life and art exceptionally well. The folks around him are a big part of that.